Earlier today, we received our 1,000,000th page view on this site. For a Fortune 500 company, that might not be remarkable, but we think it’s noteworthy on a site devoted to Lent. While the Supreme Executive Committee is not shy about trumpeting our supremacy, even we could not have done all this alone. Of course, our Celebrity Bloggers deserve the credit for writing compelling, entertaining, and even inspiring bios. We also give thanks for the Global Lent Madness Viewing Public. You keep us going whenever we get discouraged, whether it’s Tim’s Luddite inability to run a website or Scott’s procrastination at doing his part of the epic SEC book proposal that will change the face of Lent. One million page views means that many of you find something worthwhile here. We’ve heard that some of you enjoy Lent Madness because of the glimpses of God’s glory we see in the lives of saints. Many others take great delight in the vibrant conversations throughout Lent. We sometimes have well over 200 comments each day of Lent, and we’re well over 10,000 total comments. Community doesn’t end here though. 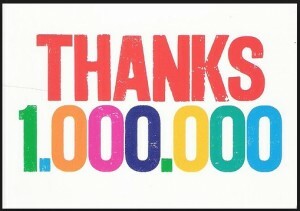 We’ve surpassed 8,000 likes on Facebook and over 2,000 likes on Twitter. Opening day yesterday set a traffic record with over 30,000 page views. Our point in sharing all this is that perhaps there is a lesson here for the church. With a very modest budget (just ask our volunteer Celebrity Bloggers) and a simple concept, Lent Madness has attracted a wide audience. Perhaps there is a message that we would do well to think about joyful ways to proclaim the Good News. Perhaps we should find other ways to do Christian education outside classrooms. Perhaps we should use Lent as a time to invite others to join us on a journey as we all seek to follow Jesus. Keep up the madness. We look forward to sharing some more numbers when we post our 2,000,000th page view. It might be sooner than you think! 39 Comments to "Thanks a million!" Hooray! Congrats to the SEC in all their glory, and to everyone who viewed this humble site! Many non-churched folk think we have no fun in church. Perhaps some of the million viewers who are not churched will take a chance and come through a church door. Being a really SERIOUS Christian I appreciate the levity with which you have infected my lenten disciplines. I am hoping that Laurie Brock will be the first Episcopal priest to host SNL! (you go Laurie!) Or at least that we get that conversation going so that maybe SOME Episcopal bishop/priest/deacon hosts. Most of the time I am way too serious for my own good so thank you, thank you, thank you! Well, the SEC just trampled all over the traditional way of “doing” Christian Ed. Hurray for you and three loud HUZZAHS !!! Of course, you’re going to pay for this outrageous suggestion. Good! It is truly amazing how LentMadness has captured and captivated the world. So far, the replies have been positive and the last year “grumps” have seemingly disappeared. Well, except for Madeleine and her Fred Rogers fixation. Great reading and very interesting. Help yourselves to a healthy portion of the praise you’re dishing out for the great experience Lent Madness is providing for so many of us. It was me. what did I win? We need the joy to continue during the really joyous season of Easter!! Congratulations!!!! Great news. Keep up the great communication and work. I was highly skeptical, and pooh-poohing sports metaphors, until Christina the Astonishing grabbed me by the throat!!! That’s what Grace will do for you–and then I was campaigning like a banshee for her. Others e-mailed me this am disappointed they couldn’t vote for her. Wild card, wild card, wild card!!! Awesome news! Doing all we can to engage folks…it works in way we never would have imagined even 10 years ago! It is a challenge to explain this to people who have never participated in Lent Madness. So often, people think that devotion is just self expression, writing a reflection or taking a picture or even walking a labyrinth. What I love about Lent Madness is the educational aspect that helps us to learn more about our tradition, but learn it within an untraditional framework. This is the best of both worlds. That is truly a notable marker. Congratulations! Yes – yes and yes. This is a wonderful way to engage people outside the church – and to learn something – and to have fun. You are awesome! Enjoy the moment x 1,000,000!!! I love the interaction of individuals that the comment section allows! Lent Madness is something of which I look forward! Felt a bit snarky about someone being early on International Women’s Day and decided to correct him. A bit of a conversation resulted and now I am following a new person (Lutheran pastor) and subscribing to his blog. So in addition to fun, education, and Lenten discipline, Lent Madness is an evangelism tool. So far my brackets completed about a week ago are spot on! Some parishes also use Lent Madness brackets to raise money. I know one parish asks for a $12 donation to ERD for Nets for Life for each bracket. So, Lenten joy is being spread and good is being done. Perhaps you ought to ask who else is using it to raise money and do a Monday Madness feature on that. I think Lent Madness is just great. I was involved for the first time last year and it was fun and I learned a great deal! This year our church, Calvary Episcopal in Ashland, KY is getting in on the “madness”. Thanks Tim and Scott! YEA GOD!!! And Yea Tim, Scott, the celebrity blogers, and all of the Million! I ordered 30 of the Saintly Scorecards and waved one around at the evening Ash Wed service during announcements. 14 disappeared that night & I’ll give the rest out on Sun. People are VERY excited–talking it up in their offices & voting. I was in a local diner this morning with mine & a woman peered at it and when she looked through it, asked if she could have one. So I gave her mine. Amazing grace. Congratulations all and Thanks be to God! Never underestimate the power of having a great Archrival. Mark D. Is that a hint on your vote for tomorrow. Not only do I delight in sharing LM with my old and new Episcopal friends but each day copy and print the pages to share with the shut-ins I minister to. I live in a fairly remote area, mostly L.D.S , Baptist, and a Catholic church. So I broke down about 2 years ago and started attending mass with the Catholics. It’s a long story but I was kind of getting wrapped up in it and forgetting my Episcopal roots. You all have brought me back to reality and reminded me that “church” can be fun. I’v been trying to organize something to get people stirred up here. Now I can be at peace with my computer and relearn alot of things I have forgot. I am EPISCOPALIAN ! and proud of it. I am glad that I have somewhere to celebrate the eucharist ( I’m even a Sacrastan ) but my heart belongs here with my fellow worshippers. Thank you . I’m really glad Lent Madness is helping you reconnect with home. The small, behind-the-scenes efforts are just as important as the ones in the forefront and sometimes the ones in the forefront would not have been successful if it had not be for the ones behind the scenes. A convoluted way of saying Julia gets my vote. May I ask, does the SEC filter out site visits by denominational affiliation? I was born and raised Methodist and am participating in the Saintly Smackdown solely to explore the Episcopal Church. I must have visited the site 3-4 times yesterday. Too top that, I recruited my very faithful Catholic sister to join Lent Madness. She has visited the site, voted (for Basil, much to my Astonishment) and is even reading the celebrity blogs. So, I humbly confess to the SEC, the Lent Madness site has been infiltrated. On the upside, based on the love and devotion to Our Lord Jesus Christ demonstrated by the members of the Episcopal Church I have wittnessed thus far, I am well on my way to trading teams. And kudos to the SEC for exceeding all expectations of Saintly Madness. We welcome everyone at Lent Madness, and lots of Methodists, Roman Catholics, Presbyterians, and sundry others are taking part. The only filtering we do is banning people who cheat while voting. Not related to lent madness i realize, but i am accessing the internet for the first time from my living room! 🙂 woo hoooo! Now i can go online at 4 am if i want to!!! I too came to Lent Madness very late this year, but I plan on making the most of the tourney solo and then spend the rest of the year getting my home parish, St. Christopher’s in Fort Worth, geared up for an all out onslaught in time for Lent Madness 2015!! :o) Thanks SEC and the rest of the brain trust!! I find it a great devotional immersion in the communion of saints: not only the saints we will learn about and vote for to win the Golden Halo, but also the companionship (another term for “communion”) of all the other aspiring saints (another term for “Christians”) who participate. I share Lent Madness on my FB page. A friend, currently working in Africa, has been bitten by the LM bug! There are intermittent electricity and internet connection issures in her remote location. So, she may have difficulty registering her vote in some contests. But, she’s game for the game! Pleased and honored to be a part of Lent Madness for the third year. Go Bach, Bedell, and Brooks! Congratulations. Who care about the Fortune 500? It’s the fortunate 1,ooo,000 involved in lent madness with the treasure.